Costco business model and business strategy can be summarized as a selection of high-quality items that get sold in bulk sized in warehouses around US and Canada primarily. 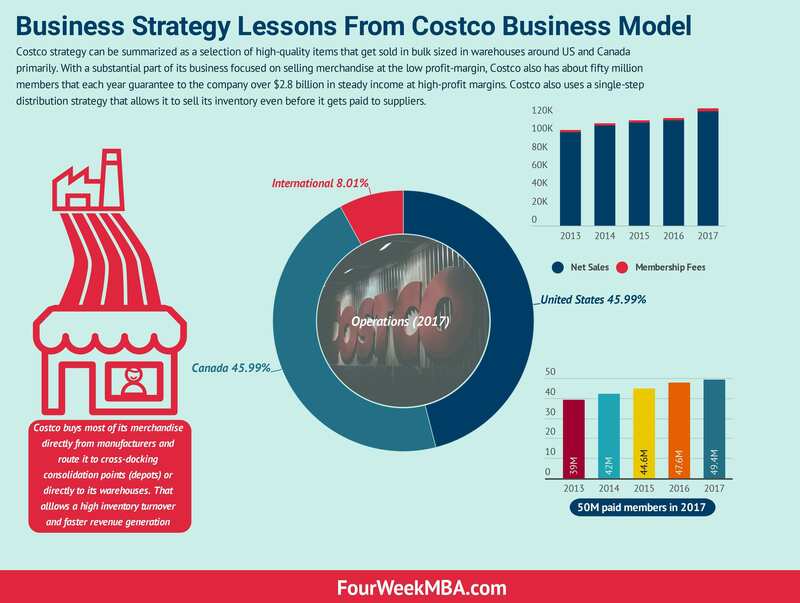 With a substantial part of its business focused on selling merchandise at the low profit-margin, Costco also has about fifty million members that each year guarantee to the company over $2.8 billion in steady income at high-profit margins. Costco also uses a single-step distribution strategy that allows it to sell its inventory even before it gets paid to suppliers. Just like ALDI tries to keep its prices as low as possible, so Costco managed to do so, by lowering its profit margin deliberately to pass those savings to consumers. Indeed, Costco wants to be recognized in the minds’ of its consumer as high quality, low priced stuff that you can purchase in bulk. There are also a few other interesting aspects of the Costco business model that we make it unique and make its value proposition compelling. The value proposition of the Costco business model is quite strong. The company offers low prices to its members with a limited selection of nationally-branded and private-label products in a wide range of merchandise categories. While those items will produce high sales volumes, they will also be driven by fast inventory turnover. While Foods represented the largest category in 2018; each of those categories plays a crucial role in Whole Foods success. Let’s see what are the critical ingredients of Costco business model and business strategy success, starting from how the company manages its inventory. We buy most of our merchandise directly from manufacturers and route it to cross-docking consolidation points (depots) or directly to our warehouses. Our depots receive large shipments from manufacturers and quickly ship these goods to individual warehouses. This process creates freight volume and handling efficiencies, eliminating many costs associated with traditional multiple-step distribution channels. The key ingredient to Costco ability to move merchandise efficiently from manufactures to its warehouses allows the company to sell its inventory quickly. Indeed, thanks to its memberships Costco knows for sure it will sell most of its inventory pretty quickly. Thus, inventory losses (shrinkage) are well below typical retail operations. Indeed, where on a typical retail operation there is a multiple-step distribution channel where the retailer has to move the merchandise from the manufacturer to a warehouse and then again to a retail store where it gets sold. Costo warehouses are stores themselves. Thus, when moved the merchandising there it gets sold quickly. Another critical aspect is that when the merchandise arrives in bulk to Costco warehouses, they don’t need much repackaging or complex and expansive operations but rather those merchandises get sold directly in bulk. Ancillary businesses within or next to our warehouses provide expanded products and services, encouraging members to shop more frequently. These businesses include our gas stations, pharmacy, optical dispensing centers, food courts, and hearing-aid centers. We sell gasoline in all countries except Korea and France, with the number of warehouses with gas stations varying significantly by country. We operated 536, 508, and 472 gas stations at the end of 2017, 2016, and 2015, respectively. One might wonder why to sell an item that has a minimal profit margin like gasoline. And the answer is simple. Gas allows Costco to attract people to its warehouses. Going to Costco is an “experience” all its way down. From purchasing the gas to stocking the car of merchandise. The two primary ancillary businesses Costco leverages on to bring as many customers back to its warehouses are gasoline and pharmacy. Our strategy is to provide our members with a broad range of high-quality merchandise at prices we believe are consistently lower than elsewhere. We seek to limit items to fast-selling models, sizes, and colors. We carry an average of approximately 3,800 active stock keeping units (SKUs) per warehouse in our core warehouse business, significantly less than other broadline retailers. Many consumable products are offered for sale in case, carton, or multiple-pack quantities only. It’s quite counterintuitive to think of as a strength the limitation in merchandising; Where other large players like Walmart and Amazon praise themselves on making available any merchandise. Costco, like ALDI, does the opposite, praises itself for limited stock selection. This allows Costco to get better vendors’ agreements, Costco customers might be happier to have less, but higher quality merchandise and it becomes way easier for Costco to manage that merchandising, which in comparison lowers its operational burden. Online businesses provide our members additional products and services, many not found in our warehouses. Net sales for our online business were approximately 4% of our total net sales in 2017 and 2016, respectively, and 3% in 2015. Even though Costco doesn’t focus on online sales, it uses it as a way to provide products and services that might not be available in its warehouses. This is a privilege that members enjoy. Costco focuses relentlessly on sales growth, by looking at a simple yet effective metric: comparable sales growth. This is defined as sales from warehouses open for more than one year, including remodels, relocations and expansions, as well as online sales related to e-commerce websites operating for more than one year. If you want to want to enjoy the Costco experience, there is no way out than to become a member. Indeed, the member renewal rate was 90% in the U.S. and Canada and 87% on a worldwide basis in 2017. The membership revenue stream – also though it represents only about 2.26% of Costco net sales yet it carries high-profit margins. Thus, on the one hand, Costco runs its primary business on tight margins, while it relies on fifty million members (and growing) that represent a stable revenue stream for Costco business in the long run.